Last Monday I met up with a few gal friends at The Music Box Theater to see Miranda July's The Future, and damn was it good. MJ has gotten a lot of press about this movie, some of which has been less than complimentary. It seems as though she has been lumped into the twee and indiexcore of film making, and after the acclaim that Me and You and Everyone We Know recieved, it seemed inevitable that critics and filmgoers alike would have impossibly high expectations. I read every article, every blog, and every review I possibly could before seeing this movie which prepped me emotionally, if you will. A lot of reviewers were turned off by how serious this film was, excpecting something light, humorous, and full of the kind of whimsy that we associate with July's films. But as an avid supporter of her work, I was excited for July to take her film making, directing, writing, and acting in a completely different direction. What I loved about this movie were the subtle differences and choices that July made in relation to Me and You and Everyone We Know. I know, as a critic, doing the good 'ol fashioned compare and contrast is a total copout - but seriosuly, after giving this movie a week of marinating in my analytic brain, I found some really interesting connections. 1) The Bildungsroman ie Coming of Age Story - Where Me and You and Everyone We Know was a coming of age story from the perspective of an aspiring artist, a separated single parent, a teenage boy, and a young child - The Future was also a coming of age story. A couple finds an injured stray cat, lovingly named Paw Paw. They bring it to the vet, and then decide to keep him, knowing that he probably won't live very long. They go to get Paw Paw, and the vet tells them it needs to stay for a month - but following the wait, the cat could probably live for 5 years plus. This deadline of five years jolts the couple into asking questions such as "Where am I now?" and "Who will I be in five years?" - with an especially poignant line in which Jason, played by Hamish Linklater says, "I thought I'd be smarter". Jason and Sophie then embark upon an exciting and nearly impossible goal to get out of their mid-thirties malaise and achieve endless goals over the course of the next month until they pick up Paw Paw, whose voice is played by July. Sophie and Jason quit their jobs. Sophie chooses to try to choreograph 30 dances in 30 days, Jason tried to save the planet, canvasing with the message the the world can be made better one tree at a time. Over the journey of the film, Sophie and Jason discover things about themselves and their future finding that their expectations and goals have not been met in fulfilling or satisfying ways. This Bildungsroman is a sadder one than that of the precurser film, but important nonetheless. 2) The Moon - Where Me and You and Everyone We Know is very much about the Sun and daytime, this film focuses centrally on the Moon and nighttime. The moon in fact plays a central character for a portion of the film, offering wisdom and solidarity to Jason in a time of need. 3) The Colors - Me You and Everyone We Know features bright bubblegummy neons that are so sweet you can almost taste them - total and complete eyecandy. 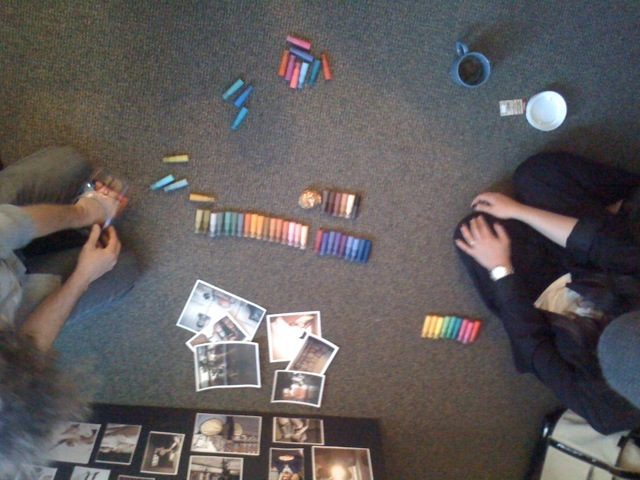 July made a conscious effort to pick a completely different color palette for this film, picking rich ochres and jewel tones. The previous movie is light and hot, whereas this one is dark and cool. Interesting how something as simple as color can be so effective at setting up a mood for an entire film. Fun fact: Miranda July picked out the palette for The Future by laying out a set of pens from the Muji store and picking out the colors she was drawn to. Read about it here. 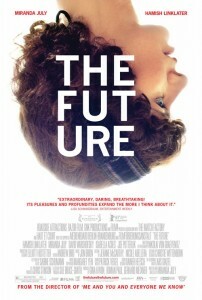 The Future is currently screening at The Music Box Theater and will be opening at locations today all over the country. If you want to see a serious, thoughtful, and beautifully made film, I urge you to check this one out. I might even try to see it a second time while it's still playing on the big screen. I'm so excited to see The Future! 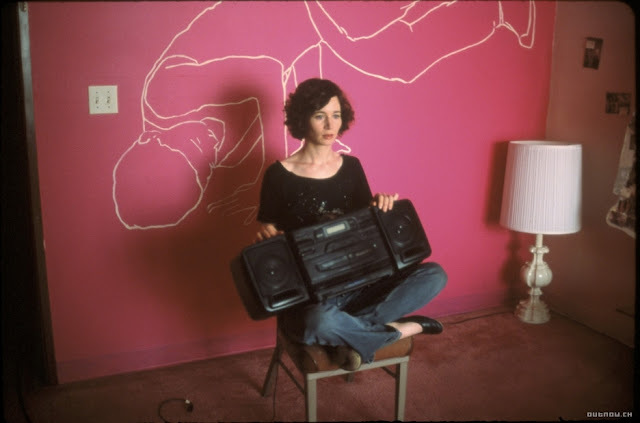 I'm a huge Miranda July fan (starting from researching her work after being constantly compared to her in my film classes, haha) but the film keeps getting pushed back here in Michigan! Now it's not opening until September! I love the Music Box theatre in Chicago though, used to live around the corner! Sandy! this review is amazing! I genuinely liked it and your analysis was spot on. I'd be willing to see it again maybe we can bring Meghan and Anthony! Thanks for giving me the link to this: it's persuaded me to see the movie. I was leaning toward doing that; you just gave me the necessary push.